It's easy to see why Evernote has legions of fans. It's like a digital brain for all your ideas, a way to capture and organize the volumes of information that might otherwise slip through your fingers. Plus, it keeps getting better, as evidenced by the recent updates to the iOS apps and the much-awaited addition of voice recognition in the Android version. Of course, not everyone uses Evernote to its full potential, especially when it comes to business. For example, are you still tracking receipts by stuffing them into your wallet? And keeping hard copies of important documents? Read on to learn about these and other ways Evernote helps with that whole work-smarter-not-harder thing. Need to document that business lunch? Or the tablet you just bought? 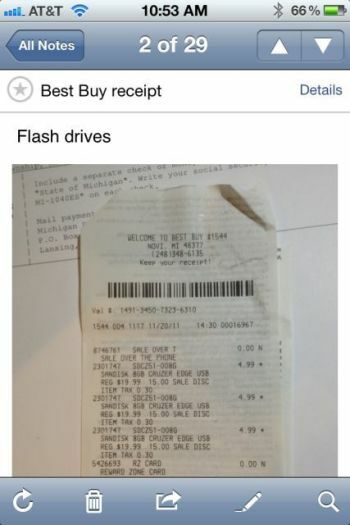 Use the Evernote app to snap a photo of the receipt. Then add the appropriate tags so you'll have an easier time finding it later. Buying things online? E-mail the receipts to your Evernote account. Once you start collecting all your receipts this way, you'll find there's no better system for keeping tabs on business-related purchases. It's great at tax time, and it's especially helpful if you need to get warranty service on something and need to produce a receipt. Quick: where's the instruction manual for your laptop? Or that contract you need to review? People often forget that Evernote can store not only, well, notes, but also documents: Word files, PDFs, and so on. That makes it an excellent digital file cabinet, one that you should definitely to use to store materials you might otherwise have difficulty finding. For example, whenever I buy a new piece of gear -- laptop, tablet, camera, or whatever -- I track down the electronic version of the manual, then add it to Evernote (in my "Manuals" notebook, of course). Evernote also makes for a passable Rolodex: just take a snapshot of any business card, then use the person's name as the title of the note. Indeed, while Google Docs is barely functional on mobile browsers (and has no standalone apps to speak of), Evernote's Android and iOS apps offer fairly robust text editing. That means you can use it for just about any kind of writing: meeting notes, blog posts, business proposals, and so on. Whenever inspiration strikes (or a deadline looms), just pull out whatever device is handiest and start typing. And because it's Evernote, your documents automatically get synced to the Web and all your other devices. While you're in an Evernote frame of mind, find out how Evernote compares with Microsoft OneNote (spoiler: it's better, though not at everything). And check out how I used Evernote to organize my PC troubleshooting efforts -- way back in 2009. Do you have a business-oriented tip to share with your fellow Evernote fans? Let's hear it in the comments.